This review first appeared in the July 19, 1996 issue of the North County Times. 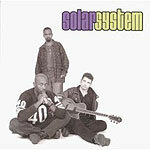 All you need to know about Solar System is to hear their first cover of "Me and Mrs. Jones." It starts off with a heavy hip-hop beat behind a rap: "Yeah, me and Mrs. Jones got a thing going on, a thing going on, a thing going on ..." and then it gently slides into a near-straight reading of the original 1972 R&B version by Billy Paul. Then it's back to the rap, and then the straight cover, swapping a few more times before a show-stopping, Vegas-style climax that devolves into a rap outro. It is one of the most thoughtful, creative and definitely hip arrangements yet to come out of acid jazz. The original songs written by the L.A. band have lyrics that address modern dilemmas, the musicianship is top-rank, the beat is consistently danceable. And besides two different versions of "Me and Mrs. Jones," Solar System also turns in a rather funky reading of Lou Reed's "Walk on the Wild Side"  slower and heavier than the original.